Three disabled students who use electronic communication devices have been invited to attend the memorial service for Professor Stephen Hawking. Jason Felce, 20, Jack Smith, 21, and Rose Brown, 20, study at National Star College in Cheltenham. The trio will attend Friday's memorial service at Westminster Abbey when Prof Hawking's ashes will be interred. The college, which teaches people with disabilities and learning difficulties, asked for some students to attend. Renowned physicist Prof Hawking died at the age of 76 in March. His daughter Lucy is a vice president of the Cheltenham college. His ashes will be interred between Sir Isaac Newton and Charles Darwin during the service of thanksgiving for his life at Westminster Abbey. 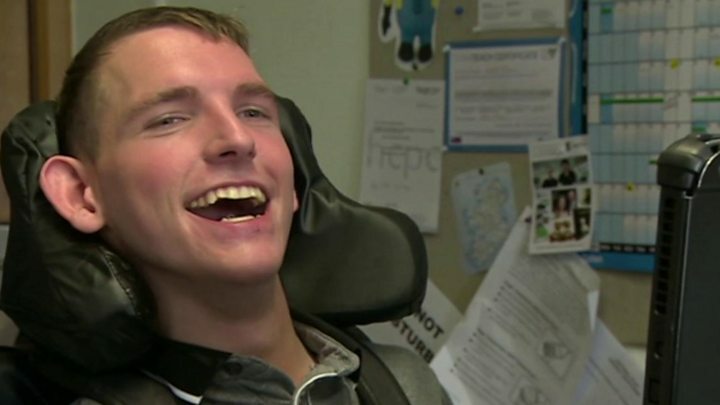 Mr Felce, who was born with cerebral palsy and who controls his equipment with eye movement, said Prof Hawking "inspired me to be the best that I can be, and not let anything, including my disability, hold me back". Miss Brown, who was left with a brain injury when she was hit by a car when she was 12, said: "I am going to be an actress. Everybody who puts their mind to something gets to be it. Stephen Hawking proves this more than anyone." "Prof Hawking was most famous for his science and the fact that he used a communicator is second." Emily Harris from the college said the chance for students to attend the service was "a once-in-a-lifetime opportunity". A public ballot was held for 1,000 seats available to the public for the ceremony. 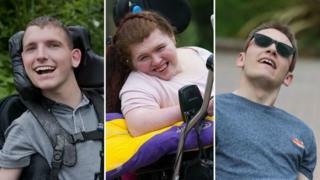 Three students, along with their carers, were invited after the college wrote to the Stephen Hawking Foundation asking for them to attend.